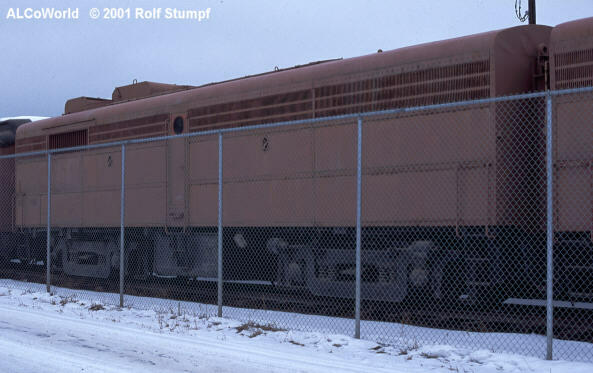 The locomotives shown below are stored next to the hwy 3 though Cranbrook BC. The (small) museum hosts a variety of vintage coaches, a large number of coaches is stored virtually all over the place (i.e. Cranbrooks CP yard) and awaits restauration for display and excoursion service. Primerdonnas: Ex-CP MLW-built FA-2 no. 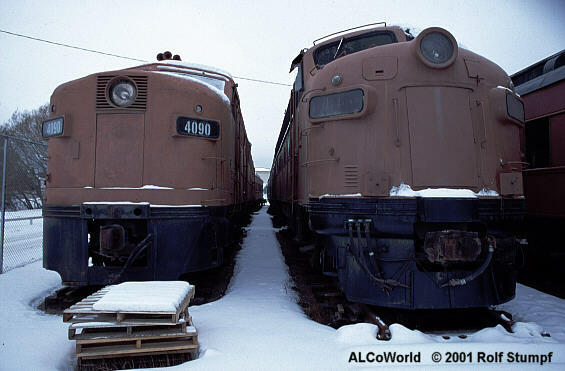 4090 is stored next to ex VIA 6557 (GMD FP9A) near the Cranbrook CP yard. While the FP9 (along with the B-unit behind it) awaits restoration for excoursion service the FA-2 is kept non-operational. January 24th, 2001. A true rarity is ex-CP 4469, an MLW-built FB-2. January 24th, 2001.